The Prodigals Club*, designed by Vladimír Suchý, is the spiritual successor to the same designer’s popular 2011 release ‘Last Will’. The original game took its thematic cue from classic comedy Brewster’s Millions, with each player in a race to squander their fortune as quickly as possible. The Prodigals club takes the idea a few steps further, with you also trying to lose political influence and your friends in society, along with all of your worldly possessions. In the satisfyingly weighty box (well worth the £30 asking price) you’ll find around 100 cards, 33 wooden tokens and a tree’s worth of cardboard (14 boards in various shapes and sizes and 100 tokens). The art and component quality is great throughout, perfectly catching the light-hearted theme. As you’ve probably guessed from the component list this is very much a euro game, with worker placement being the key mechanism. And there’s a lot to think about on every move, making this one fall solidly into the ‘medium weight’ euro category. It plays two to five players (more on that later). The box claims 45-90 minutes, and at the shortest game state we’ve had it as low as 70 minutes – but that in no way includes setup/take down (it’s fiddly). With four or more and with all three boards you’ll likely be running two hours plus, even with experience. 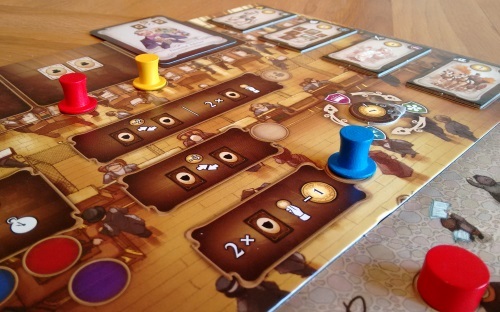 As is often the way with euro games from Czech Games Edition, Prodigal’s Club is simpler mechanically than it may lead you to believe at first glance. Despite a plethora of moving parts and a fiddly set up/round reset, the game’s is actually pretty straightforward. A bit of a brain-burner for sure, but that’s in how you use your actions rather than their individual complexity. 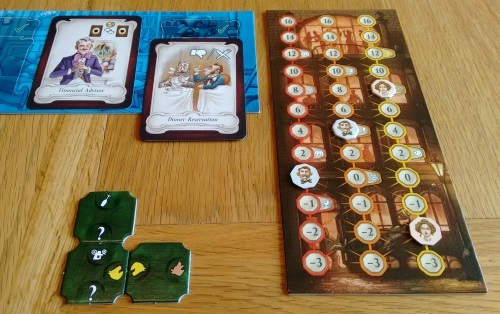 Each player will have a certain number of errand boys (read: workers, represented by top hats) which they will place onto the board, one at a time in turn order. These will either give you an immediate action, cards to play at the end of the round, or a token (varying uses). After errand boys are placed, players play as many of the cards they’ve picked up (and any tokens collected) as they like to further (or lessen?) their cause. You can play with two or three of the included game boards (possessions, society and election), while anyone owning Last Will can cannibalise it for a fourth option. In each one you choose you’ll start with a certain number of money, friendship or votes accordingly. All your actions see you losing them in some way, with the winner being decided as in classic abstract game Ingenious: the one you’ve done worst at (so your highest remaining score) is your final score. I’d agree with the suggested idea of using just two boards for teaching, as it reduces play time a little as well as the decision space. But in my experience the possessions and election boards are a little easier on the brain for beginners – which goes against the selections in the rulebook. As mentioned, the basics of the game will be easy for anyone with worker placement experience – but it’s the complexities that make the game shine. For example there are symbols across all the game boards, cards and various tokens (wine glass, horse, dog, mansion etc) that often help trigger actions: perhaps a card will let you lose one vote for each dog symbol you have. When you play your cards at the end of the round, you can do them in any order – so it is often possible to manipulate your position cleverly to trigger this type of card to better effect as you play. So you may be able to use one card to move a person on your society track down to a space where it occupies a dog symbol before you trigger your ‘dogs lose votes’ cards – then move that society figure down further to help trigger another card. The writer: One of the keys to this kind of game is not being able to zero-sum situations, and The Prodigals Club solves this by letting you keep up to four cards in-hand each round. Not only does this let you puzzle out some fun and clever combos, but also keeps your opponents guessing in terms of what your true game position is at any given time. The thinker: While I like that a euro game has taken the Ingenious scoring idea, I can’t help missing the abstract purity of the original. The real key to Ingenious was spotting the tipping point at which you started to block off a player’s chances to score a colour. Here that is negated by having just 2/3 scoring charts, plus a plethora of ways to reduce those numbers. But it is still a solid, thinky euro game with many more good points than bad. The trasher: I didn’t like this one at all. It’s hard to get your head around and repetitive, meaning if you don’t start off liking it you’re unlikely to change your mind. It’s also a bit solitary, and missed the chance at adding things to hit others rather than just helping yourself all the time (maybe an expansion?). Sure you can block board spaces or take cards other’s want, but the symbols mean that you’ll often be taking a card that is pretty useless to you which just wastes your own turn. The dabbler: From the board art to the fabulous top hats, The Prodigals Club is a thematic breath of fresh air. But that said, I really feel it could’ve taken it further. As much as it would seem to carry its theme, I’ve seen precious little table talk in character. Because I think that, despite its Brewster’s Millions veneer, this is an deep abstract euro first and a thematic game second – and a bit too much for me because of it. There’s just a bit too much going on, as in many of CGE’s games: a few less symbols and wrinkles would probably have made it both more fun and accessible, without losing much in the process. My biggest problem with The Prodigals Club is the amount of choice in setup. I realise this goes against the grain of the common ‘replayability is all’ mantra nowadays, but I really don’t buy that. Two boards or three? And what is better with X players? Crikey – it’s your game, damnit, you tell me! You should know after all – you designed it! With two players, for example, its easy for both players to get to below zero on both tracks but there is only an ‘official’ way to track this on one of the boards. Otherwise it says ‘keep a note of it’. Great – in a game with this many components, you want me to grab a pen and paper…? At the other end of the scale, the game is a massive table hog. With three boards in play and five players you’d need a massive table – and a good three hours – to make it happen. I can’t help thinking that if it had been two to four, with two boards of three (and no extra board option) they could’ve made a tighter and slightly better board game. I really don’t think the third board adds that much (if anything) to the play experience, so why give me the choice of adding it? I’d sooner have the game the best it could’ve been. I’ve come to find my sweet spot with The Prodigals Club, but that took patience and several plays. Many people are going to be (and have been) put off of this on their first play purely because of this rather botched attempt at reaching for ever more ridiculous ways to shoehorn in replayability and a bigger spread of player numbers. Ironic, no? Another issue for some will be the randomness of how the cards come out. As the thrasher mentioned above, some combos will come out that clearly favour an opponent – but by taking them (outside of a two-player game) you can really weaken yourself, so everyone else benefits. Unfortunately, if you don’t have the right position to make them work, some cards are very weak to some and awesome to others. And finally, the game can definitely be seen as a little dry, puzzly and mathy, which in the theme fails to suggest – or does it? What could possibly be more calculating than trying to lose all these things? I guess the only thematic issue is the humour – something the game only demonstrates in the artwork and some of the card names. Despite some early reservations I’ve ended up becoming very fond of The Prodigals Club. It gives your brain a good workout (there’s a strong puzzle element) while not really punishing you in a competitive way – pretty typical mid-weight euro stuff. But the great theme and novel scoring, plus the mix of immediate actions and end of turn planning, take it a cut above the average in a very busy marketplace. Not a keeper for me, but it was a very, very close run thing! If I wasn’t handing it off to someone in my local gaming group, I doubt I would be parting with it. A really good game, despite a few annoying issues in setup.